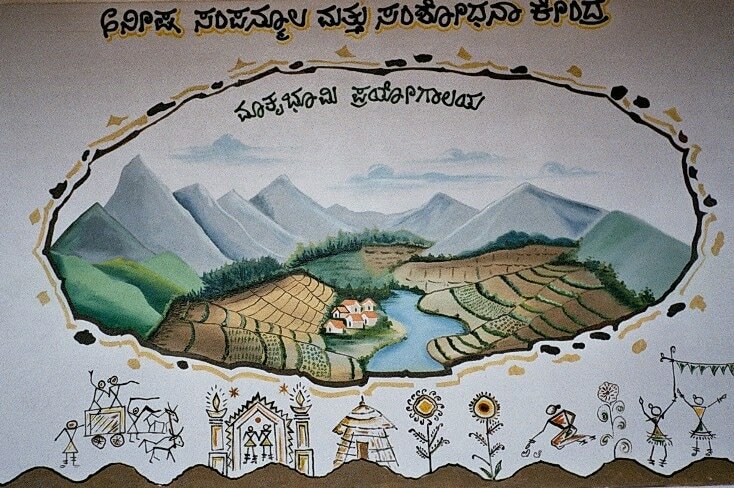 Painting in the entrance hall of the Anisha Resource Centre. Anisha is a small, rural development and food security organization, working in the Martalli region of the drought-stricken district of Chamarajanagar. Although Martalli is covered by family-owned farms, only those who are able to irrigate their land, can make a modest living. Many of the dry-land farmers have abandoned farming and are seeking employment as migrant workers in the many granite quarries in the region. Anisha trains these farmers to revert to the traditional practice of biological land cultivation that prevailed in India until the Green Revolution in the Sixties. They learn how to improve the degraded soil with biological matter, conserve water and to make their own natural herbicides and pesticides for healthy plant growth. Anisha also encourages the establishment of kitchen gardens, gives out native seeds from the project-owned seed bank, provides credits from a revolving fund and encourages all project participants to support one another in self-help groups (Sanghams), it spearheads income-generating activities - lately also small animal husbandry. It is the goal of Anisha to empower project participants to become self-sufficient with respect to soil rehabilitation and fresh food and to be leaders of change in the region, spearheading a development that will improve the lives of many and make them independent of costly external factors. Anisha is a member of Susila Dharma International Association and holds partnerships with various national Susila Dharma organisations worldwide as well as with other institutions and individuals.